“Oyez! 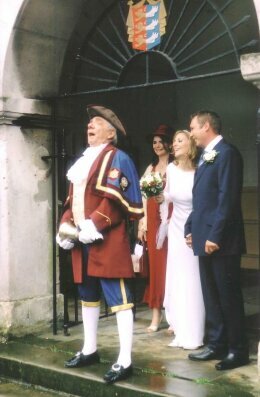 Oyez!…The sound of the Rye town crier telling the world about your wedding! The ancient English Town of Rye lies on the East Sussex coast on the edge of the High Weald Area of Outstanding Natural Beauty. Once virtually surrounded by the sea, this small and characterful market town is steeped in history – it is one of the Cinque Port Towns, lined up to resist a Napoleonic invasion. Be a part of this historic splendour by tying the knot in the magnificent 18th-century Rye Town Hall, a Grade II listed building in the Rye Conservation Area. Weddings are conducted in the elegant Council Chamber, a former courtroom that provides a unique and historic setting for the ceremony. And having the town crier on hand to welcome guests and ‘cry’ the union from the steps of the Town Hall is just the icing on the cake.